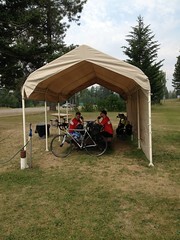 Day 15 | Rest Day- Eureka-Whitefish | captain-nicholls | Le Tour de U.S.
Jim left us this morning after a Subway breakfast. 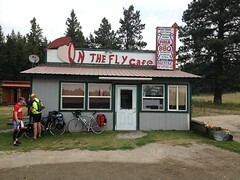 We road for about 25 km until we saw a little coffee shop and had a break. Great latte and Francois had a delicious looking cinnamon bun. I had picked up up an apple pastry earlier at a grocery store. Spoke with a guy at the coffee shop who has been on the road since April. 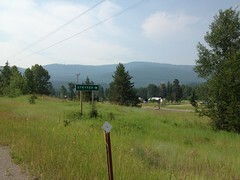 Took a road side break around 55 km and road the rest of the way to Whitefish on one of the crappiest shoulders I have ever seen. 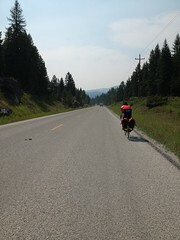 Whitefish is nice with a pretty big tourist base. Trevor broke another spoke so we went to a bike shop. We stock up on fizzy tabs and Francois and I bought more Buttr'. We leave his bike and we ride to the motel. 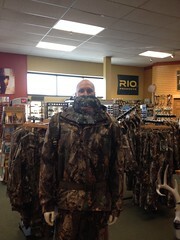 We are told that Browning isn't great so we started to call around for motels for tomorrow. 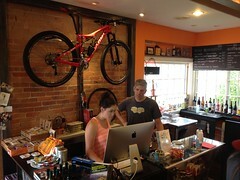 We ended up booking in Browning and the guy at the bike shop says "it's part of the experience". We have lunch at "the Quickie" and I had almost delicious pesto chicken sandwich. Back to the motel and then we head off to see Planet of the Apes. Before the movie we shopped at an almost dead mall. A gift shop offered trinkets, second hand clothes and of course, guns. The movie was great. we stopped at DQ on the way back and I had my first DQ burger in over 8 years. It was awesome.